Although the technology used for modern dental implants is fairly new, instances of people replacing missing teeth has been evident dating back to ancient times. In ancient Egypt, Egyptians believed that pharaohs should enter the afterlife with a full set of teeth. Archaeologists have found metal replacement teeth hammered into their jaws postmortem. A similar situation was uncovered in France where a body dating back to the first century was found with a metal tooth hammered into the jaw. The next important discovery was in 1931, when archaeologists uncovered a skull that had seashells shaped as teeth in the jaw. At first, they thought the seashells were put there after the person died, but after closer examination they found out that that the seashells had started to fuse to the jawbone. This meant that these seashell replacements were implanted while the person was alive, and was somewhat functional. Today’s modern dental implant surgery owes its beginning to the discoveries of Swedish orthopedic surgeon Per-Ingvar Branemark. In 1952 he discovered that healing bone tissue would fuse to titanium. 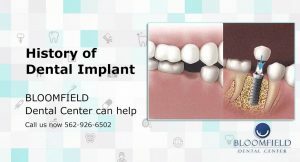 This phenomenon would occur through a process called osseointegration, in which the bone tissue grows normally around the implant and does not react negatively to the foreign implant material. Previously, dating back to the 1800s, scientists unsuccessfully tried fusing healing bone tissue to various other metals. Their tests failed because the bone tissue reacted negatively to the metals. Branemark was the first to attempt the experiment using titanium, and was therefore successful. In 1965, he performed the first dental implant surgery using a titanium post in the patient’s jawbone. Branemark’s discovery and successful experiments over 60 years ago are the reason that titanium is still used in dental implant surgery today. Although the technology around it has continued to advance throughout the years, titanium is still the main component that allows this process to see extremely high success rate in dental implant surgery patients worldwide.